History Tidbit – Back in the early 1800s, public transportation between Mexico City and its surrounding municipalities was in great need of modernization. There were some failed projects to build a railroad, but several animal-drawn tram routes were already operating from the downtown area (Zocalo) to other neighbourhoods. By the 1850s, these routes had been extended to villages near the city, such as Tacubaya, San Angel and Tlalpan. By the turn of the 20th century, electric trolleys began to substitute animal power. Later on, all the villages had been swallowed into boroughs of Mexico’s capital city, and other mass transportation systems such as buses, and the very successful Metro (the first subway line started operation in 1969), eventually took over the trolley routes; the Tlalpan line was one of the last to disappear, replaced by a light train in the late 1980s. Back in the day, people travelling from the small villages would be hungry after their long commutes to the city, and many vendors realized there was a demand for – street food, of course! In Tlalpan, in particular, the omnipresent corn dough preparations, such as quesadillas, are still a classic antojito (craving) granting a visit on a weekend morning; less known is that some of these vendors offered a more satisfying and healthy option: Caldo Tlalpeño (Tlalpan style soup), a dish so good and hearty, that has become a culinary treasure nationwide. Caldo Tlalpeño is one of those wonderful concoctions that allow a lot of variation without losing a bit of flavour or authenticity. Although the “king of the castle” continues to be the original recipe with chicken, cheese and a good amount of chipotle peppers, it may be modified into a vegetarian, or even vegan version, and sensitive palates need not find it scary, since the spiciness may be simply reduced or eliminated altogether by serving the chipotles on the side. This hearty dish is still frequently served on its own, but may also act as a first or second item in a three course meal. If using chicken, place halves in a pot along with the onion, salt, and enough water to cover the chicken. Bring to a boil over high heat, then cook on medium-low for about 35 minutes, partially covered, until cooked. Remove breasts, discard skin and bones, and shred and reserve meat. The broth may be strained and used in the soup, discarding onions and anything else caught in the strainer. I am joining What’s for Dinner? 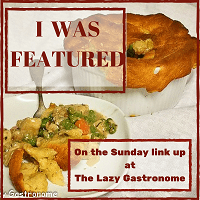 Sunday Link-Up # 170 hosted by Helen @ The Lazy Gastronome, always with great recipes and menus for the whole week. Oh Yum! I will try this. Chicken and chipotle is a lovely soup combo. Some of the other additions, particularly the chickpeas are new to me, and it sounds delicious. Thanks! Thank you, Steph, I hope you like it! Thank you for posting this recipe!! My pleasure, I hope you get to try it! Indeed it might. I was thinking about that as I read it. Oh, let me know how you did it, to add to the possibilities. Yummy! I loved reading the history of the soup. And the soup sounds so good! Pinned! Thanks for sharing at the What’s for Dinner party – hope to see you next week too. In the mean time, have a fabulous week ahead! Thank you, Helen, you as well! Learning history and gaining a great recipe. Fantastic , Irene. Avocado as a topping for soup? That’s interesting, and must be very delicious! You know I love me some soup and this one looks so delish! It is going on my to make for sure list! Thanks for introducing us to this masterpiece! Thanks for bringing this by Fiesta Friday! It is truly a crowd pleaser; thank you for hosting Fiesta Friday this week, and for your kind comment, Mollie! Hi Irene. I made this soup last night and it was a super hit! Thanks again, for sharing the recipe. Hi, Punam, thank you for this and all your kind feedback; I am so glad it was well received!